Writing a thank you note after a job interview is not optional. This expression of gratitude after an interview is not only good manners, it’s good strategy, keeping you top-of-mind with a potential employer. The thank you note is your opportunity to reinforce why you’re a strong candidate and reiterate your interest in the role you’ve interviewed for. Brevity is key; don’t relive the entire interview or restate your resume (or, for that matter, attach it — unless requested). Instead, take a moment to reflect on the position and company, as well as your interaction with the interviewer. Since email is now standard practice for a thank you note, timeliness is important. Being prompt, however, doesn’t mean firing off a quick message from the elevator right after the interview, but sending it the same day is recommended. Waiting several days to send your note is noticeable and potentially detrimental (especially if a hiring manager is making a decision quickly). Handwritten Thank You Note, Too? Handwriting a note is a nice, but optional, extra touch to stand out from the competition. Email, however, is a must! If you plan to send a handwritten note, email first anyway so not to risk the employer forming a negative opinion of you due to “snail mail” delays. The interviewer may be filling multiple positions, so briefly restate the position for which you’re being considered for the interviewer’s clarity and convenience. Convey interest, but don’t overdo it. USING ALL CAPS is a bit much, as is ending a sentence with multiple exclamation points!!! If you’re all the more excited after learning details about the position or company, communicate this, but with appropriate restraint. 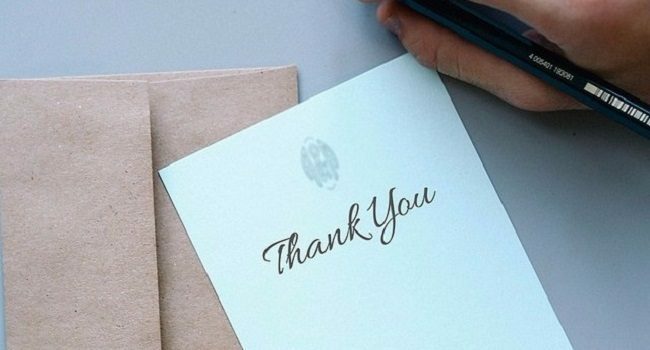 Your thank you note should be warm and personal, but not overly casual. You’re not emailing your significant other or txting ur BFF, so stick with proper business writing and omit emojis, abbreviations and slang, KK? ;-) #greatcompany (LOL). Brevity is your friend. Thank the interviewer for his/her time, call out elements from your conversation that tie into the unique value that you bring to the position and summarize why you’re such a great fit. Briefly reflect on and express appreciation for what you took away from the meeting. If you met with several people, whether one-on-one or as a group, send a separate thank you note to each person. Group emails come across as lazy and may be misconstrued as a lack of interest in the job and company. Send a different email, tailored to each interviewer, reflecting the most recent conversation you had. Include that you look forward to continuing the conversation (always a nice touch). If you meet with the same person during several rounds of interviews, send a new email each time. Besides triple checking that you spell the recipient’s name, title and company correctly, read the content out loud to catch mistakes (spellcheck won’t catch everything). If a thank you email is the final impression you make on a potential employer before the hiring decision, you don’t want typos and other errors to affect the employer’s perception of you! The thank you note is a simple, yet key component of interviewing that propels the hiring process forward and contributes to the impression you make on a potential employer. A timely, thoughtfully written message is also important after informational interviews and networking meetings. The thank you note reflects your personal brand and contributes to the lasting impression you make on professional contacts.